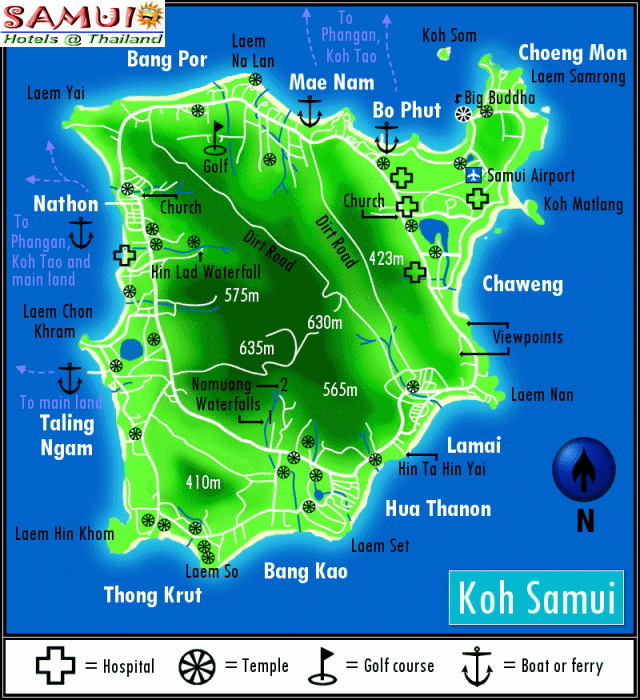 Laem Set Beach, is Samui's Second largest resort area after Chaweng. It is quieter and less bustling than its big sister, but still with plenty of accommodation, dining and shopping options to be found, and some great spas and tourist sites to explore. In terms of popularity, the tourist facilities and the quality of the beach itself, Lamai comes a close second to Chaweng, but with a less frenetic ambience. The general atmosphere is laid back and Lamai has slightly older, and by extention cheaper tourist facilities than Chaweng, although there is some indication that the area is slowly being rejuvenated. Lamai Beach is the location of Wat Lamai Cultural Center which is an 200 years old temple. The temple displays many antiques. Location: Center of Lamai beach. Offer 16 standard and comfortable. The rooms are designed in a modern Thai luxury style. We provide warm and friendly service. Our bungalows are cool retreats from a rushing world outside of the resort. 25 comfortable and spacious rooms, stylishly decorated with contemporary Thai furnishing, tasteful artwork. We have at disposal 14 beautiful apartments. Varinda Garden Resort is located high on hill with stunning view of Lamai Bay. fan and Air Conditioned bungalows. 18 Rooms with A/C, Cable TV, Hot water shower. Fan & air-conditioned bungalows and rooms. Samui Beach Resort is the ideal place to stay during your visit to beautiful Koh Samui. located straight in the center directly at the beach and connected to famous and original Swing Bar. New Luxury full service apartment as new modern luxury style. There are 10 villas and 64 standard rooms scattering in 2.5 acres. All rooms decoration & amenties are made from thai northern products. All rooms king size bed only. a beautiful 3-storey hotel complex featuring only 52 rooms and 8 villas on the southern end of Lamai Beach. All the rooms have panoramic views across the bay, and on a clear day you can see across to the mainland. Location: South of Lamai beach. A four stars Resort, front beach. A small hotel. With a magical peacefull garden, you feel yourself relaxing and get the feeling your are somewhere special. only ten well furnished and very comfortable rooms with private terrace in four different categories built around the pool. 22 fan and air-conditioned bungalows at a quiet location. Room with Hot and Cold water shower, mini-bar, A/C, private balcony in every room. Location: Middle of Lamai beach. There are 50 rooms, 20 fan rooms and 30 air conditioned rooms. Place perfectly achieves its concept of modern living by the water. 18 Wooden Villa and 6 Rooms (Building). A fusion of modern and traditional Thai architecture is a theme which runs throughout this enchanting resort. The accommodation includes pretty bungalows surrounded by a tropical flowery garden. offer simple fan bungalows in our beautiful wooden beachfront bungalows as well as concrete ones at very moderate prices. Location: North of Lamai beach. Ninja Place is set in a beautiful location in Lamai. The resort consist of 33 deluxe sea view, pool view, garden view rooms and 16 standard rooms with all private balcony. Lamai Buri is a fully-serviced resort and hotel in Lamai, Koh Samui. 19 Air-conditioneur Bungalows. 7 Fan Bungalows in tropical garden. 69 Rooms and 5 Bungalows. Our aim is to offer very affordable and clean rooms with most state-of-the-art standards. 133 rooms in six colonial open style architectures and connecting rooms are also available. Beach front villa and Sea view villa in a Thai-style house. Small but Perfect Formed Boutique resort, stylish, luxurious & romantic escape. Location: South of Lamai beach with private, secluded coves. 33 Luxury Bungalows, Villa’s, Junior Suites, Deluxe rooms and Family accommodations. A relaxing bed & breakfast guestroom with spacious guestrooms. just 500 meters from lamai beach. A Thai Style Villa near the beach in a coconut garden.